As coaches and players spoke of development, there was the reality that most of the roster is bound for other locales. As much as the Knicks have eyed the stars of the free-agent market such as Kevin Durant, Kawhi Leonard and Kyrie Irving, much of the roster now is heading toward their own free agency. So who figures to be back in the makeover? Kevin Knox: While there were plenty of questions this season — his shooting struggles, defensive lapses and low motor — the 19-year-old showed enough to make the Knicks believe he will become a consistent part of what they hope are better times. Mitchell Robinson: He is the one player the Knicks point to as a success story, justifying their scouting work before the draft and their player development. 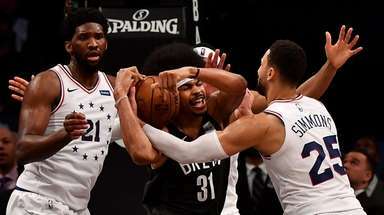 Remember this: He blocked nine shots in a game early in the season, so that skill came with him, and he has shown little in actually becoming a steady, smart defender or expanding his offensive arsenal beyond dunking lobs. 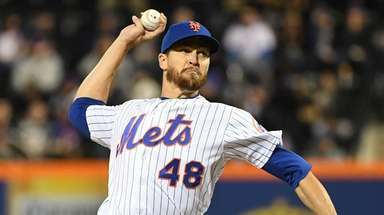 But he is a blank slate of athleticism and length that the team is convinced will become something much more. Damyean Dotson: The last pick of Phil Jackson’s tenure, Dotson earned a starting role much of this season. His low-cost contract for next season makes him a nice bench accessory if the Knicks land the type of high-priced talent they seek. Dennis Smith Jr.: His fate in New York could hinge on a ping-pong ball, not a basketball. Say the Knicks end up with the second pick in the draft and Ja Morant is awaiting them. And what about the possibility of free agents such as Irving or Kemba Walker? If he could become what he shows flashes of, the Knicks would have a low-cost, under-contract option at point guard, but he hasn't consistently displayed it yet. 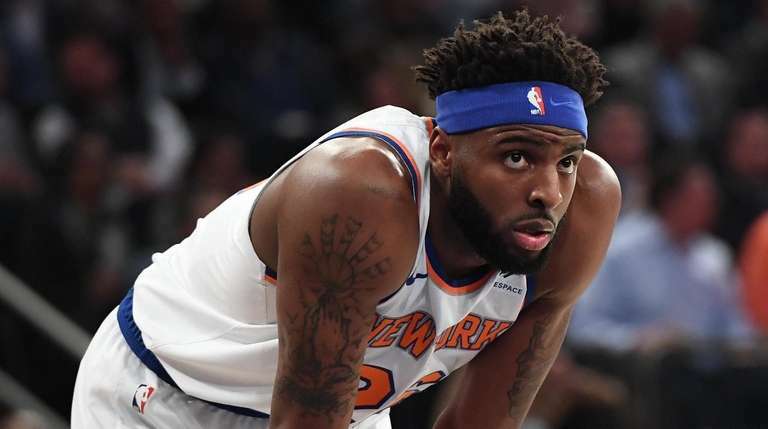 Frank Ntilikina: If the explosive Smith is not assured of a role, then what of Ntilikina, who has spent two seasons in limbo since being grabbed with the No. 8 overall pick? When considering what the Knicks hope to add, wouldn’t a defensive-minded, pass-first point guard fit nicely, say, alongside Knox, Durant, Robinson and Zion Williamson? It’s hard to find a person in the organization who has shown that faith in the lottery pick, though. 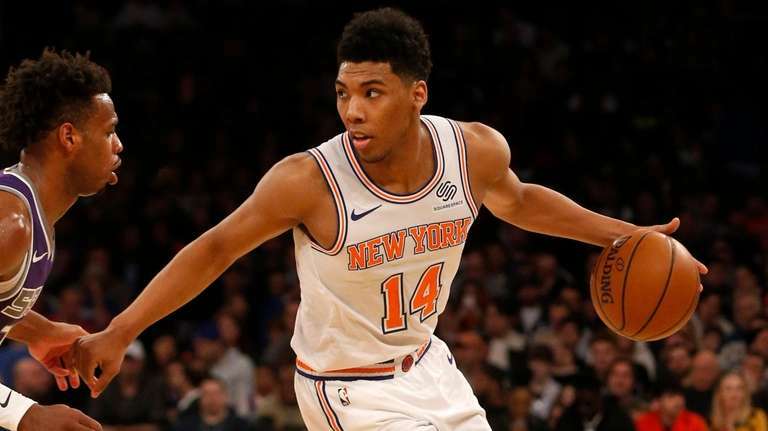 Allonzo Trier: You would think this would be an easy decision — an undrafted rookie who began the season on a two-way contract and displayed the offensive firepower to prove he belongs on an NBA roster. But the $3.5 million team option the Knicks handed him when they signed him to a standard contract is pricy for a team trying to clear every cent to chase the stars of the free-agent market. The Knicks certainly aren’t going to let a bench scorer stand in the way of pairing a Durant and Irving, for example, so they may need to pass on the option and hope to bring Trier back on a team-friendly contract. 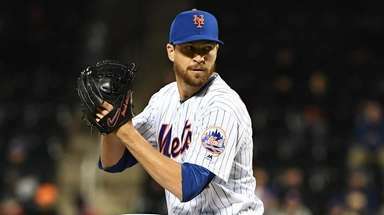 Lance Thomas: The $7.6 million team option is an illusion and the 30-year-old unofficial team captain can plan on the $1 million buyout being deposited in his account. But Thomas holds value to the organization as a locker-room presence and could come back on a cheap deal. Luke Kornet: The G League pickup is a free agent now, but if the Knicks could retain him on a vet minimum deal, it wouldn’t be surprising. 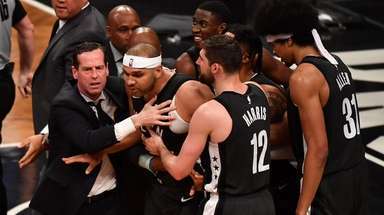 Coach David Fizdale was enamored of his ability to stretch the floor at 7-1, living outside the three-point line. Emmanuel Mudiay: Arguably the Knicks' best player this season, he resurrected a career that seemed on the decline in Denver. But if his $12.8 million cap hold isn't renounced at some point this summer, things have gone drastically wrong in the rebuild. Mario Hezonja: The Knicks aren’t going to be fooled by the three-game stretch in the final week of the season in which Hezonja was given the ball. He started twice at point guard and put up 29 points, then a triple-double and finally 30 points. You could see him in Golden State’s ever-changing cast of characters contributing off the bench, as Jonas Jerebko has done for Boston, Utah and now the Warriors. DeAndre Jordan: It’s still hard to understand why Jordan, with free agency awaiting him, didn’t opt to ask for his release so he could play in the postseason. But he sat on the bench down the stretch, mentoring Robinson, and now hits free agency. While the Knicks have praised him incessantly -- a wise move, given that he has a relationship with Durant — he figures even in a new NBA center market to pull an expensive contract. Hard to imagine the Knicks being able to afford him, particularly with Robinson already in place at center. Noah Vonleh: Remember when Fizdale called him the Knicks' most complete player? 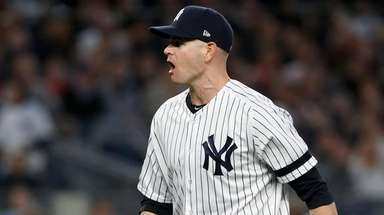 He struggled offensively after a solid start and then missed the last 13 games of season with a bone bruise in his ankle. He proved himself a solid two-way player, but what would fit at his current contract might not be possible next season as he impressed enough to earn a bigger deal. 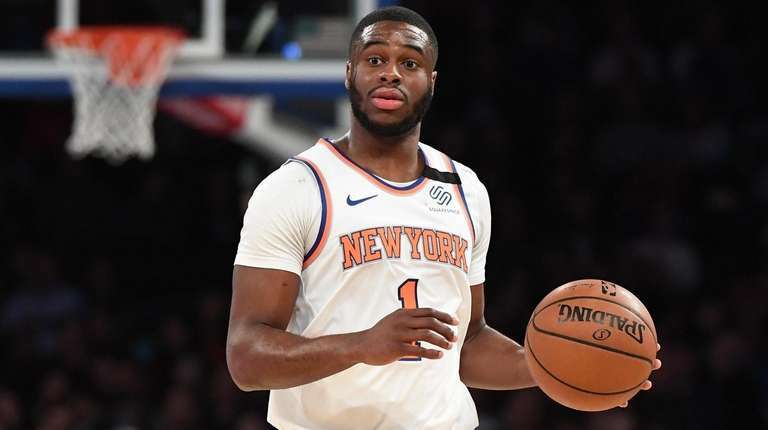 Kadeem Allen: Allen showed that he belonged in the league with his G League call-up, but if the Knicks add a point guard and have Ntilikina and Smith under contract, his future could be with a third team in three years. John Jenkins: Showed off the shooting ability that has kept him hanging around the NBA, and while he could be a useful bench piece, at 27 years old, he has become a journeyman who could be bound for another home. Henry Ellenson: The last first-rounder to arrive after failing in Detroit, he is unlikely to stick around for the next phase. Billy Garrett: It was a nice reward for Garrett to get a chance to log NBA minutes after two full seasons in the G League, but there is no room for him in the rebuild. Isaiah Hicks: His two-way contract still couldn’t earn him more than token appearances with the Knicks.